Stamp a Little Love Baby! : I Lava You! What a fun set! And that card is super cute! OMG Cami, you're card is AWESOME!!! I love the heart DP...another trip to MOT I go! A fantastic card Cami!! That paper on the black is perfect for this image!! Love, love, love your card. That paper is awesome with it. Love the smooch ink, I need to pull mine out more often. 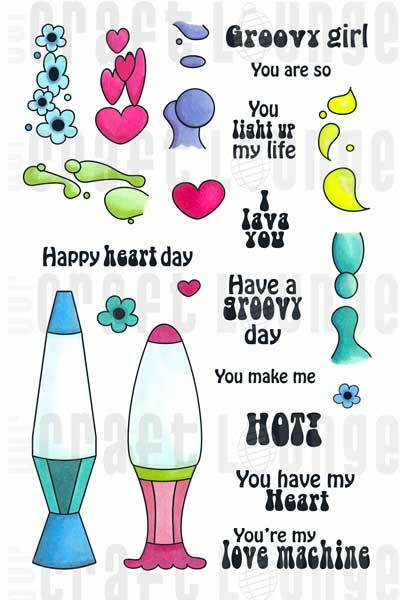 now I remember lava lamps from when I was a kid ..... fun card! Love your happy love card Cam's so cute!! Love the way you made the Lava lamp pop! What a super ADORABLE card Cambria!! I LOVE that Lava lamp! 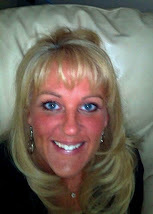 I LOVE that 3D, bejeweled lava lamp, Cami!! Super cool! How fun! I've missed seeing your posts & can't wait to see what you will make next!! LOVE LOVE LOVE it! Cami is STAMPING! *woot woot* Seriously awesome - LOVE what you did with the lamp! Groovy Card :0) I like it! Stinkin cute card Cami! Love the glossy accents over the glass part. That is just an awesome stamp set....fantastic card too. OMW!!!! That paper is perfect for this card! That set is so awesome, it brings back a lot of 70's memories! Omg, what an adorable card!! It's so fun and the paper really brings it all together. Lava lamps take me right back to my teen/college years! CUTE! This is an adorable card and a great set! Thanks for sharing! What a groovy card! :) Love it! Love this cute set. This set looks like a lot of fun. TFS! OMGosh your card is AWESOME! Love the glossy accents! Have to say this is one of my favorite sets! Yes! Knew that you would have this set. Love it and it fits you perfectly! Great card Cammie! LOve this set and your card is awesome!!! What an adorable set. So funky and wow! I would be honored to win such a great stamp set. Love it! I want the lava lamp! Oh brings back memories!!! Very cute!!! That lava lamp is just fabulous! Looks great with the patterned paper. I think this is my favorite set. Thanks for the chance to win. This is a GROOVY card!!!! I love, love, LOVE it!!!!! Cami, you ROCK! Love this set - the era is totally captured with it! A different but fun set. The card is really cute and I love the paper. I lava, lava, LOVE it!! Oh my gosh, and I SOOOOO want to touch it! HOW COOL! Cami! So much FUN! I still have my lava lamp! LOL Can't wait to play with this set. What a fun set! I remember when the original lava lamps were a HUGE deal! I just LOVE this card & the stamp set!!!! The paper you used is fabulous too! O.M.goodness!!! Could this be any more perfect?! 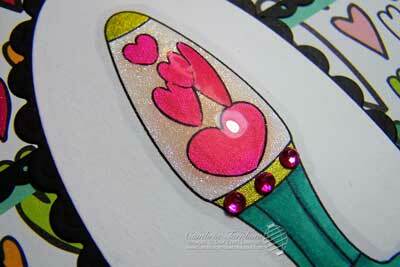 LOVE that paper, and you are brilliant to stamp that lamp that way! Whoa! Such a great card! Bright and cheery! What a cute set and cool technique to make the lava lamp look domed. Would love to win this. I am so back in the 70's looking at your card. My lava lamp didn't have hearts though! Your card is so gorgeous, I couldn't take my eyes off it. Dont'cha just love that smooch? Love your card - it really made me smile!!!! I even have that paper!! Thanks for sharing!! I love the set and absolutely love OCC, keep up the great ideas. 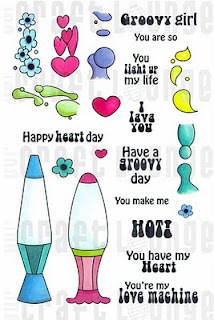 love the brights hearts background paper! This set is so GROOVY! Your card is just "cherry" as we used to say back in the '60's! I love the paper!!!! Fun fun fun card Cami!!! This set sooo reminds me of my teen years in the '70's(so long ago) would love to win it. Love your card made with it TFS. I LOVE this set!! My daughter would adore some framed art made with it - she loves her Lava Lamp!! Lava fun with the image!! I LOVE your card and what a great set! It is nice to see some "new" stamp set images coming out that have not been used before or re-vamped. Sparkle AND shine - nice!